WOOLWICH TWP. 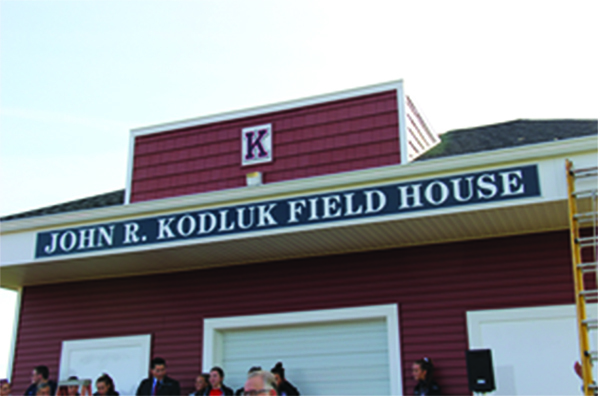 – Students, staff, parents, and retired faculty gathered in October in remembrance of a friend, colleague, teacher, coach, student advocate, and role model to countless students and athletes as they remembered John Kodluk by dedicating the new field house in his name so that the generations of educators and students who come after him come to know who he was and what he meant to our Dragon family. John’s mother Maria, brothers Steve and Dave and wife Marie experienced Kingsway’s testimony to a distinguished educator, coach and role model.